Travel Oops: The Queen’s Birthday — A Royal Rager? The Orange crush streaming out of Centraal Station and on to the streets of Amsterdam indicated that the Dutch — especially young people — must love their Queen Bea. 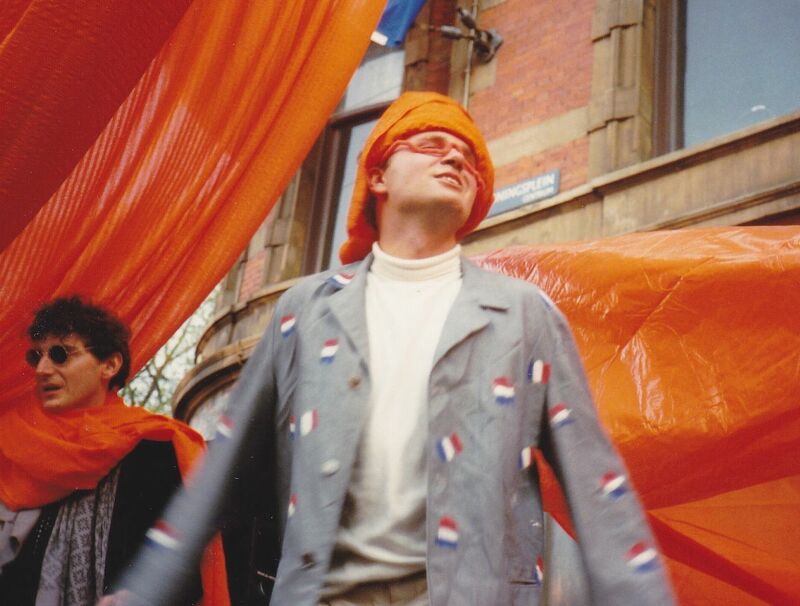 Throngs of Dutch citizens waved flags and sported the Netherlands’s national color, orange — lots of orange. Revelers even dyed their hair in flaming shades of tangerine, tangelo and clementine. To be honest, it looked like my roommates and I had stepped into a Florida citrus convention. 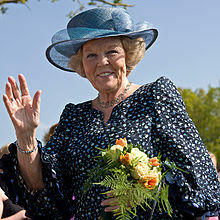 It was Koninginnedag — Queen’s Day, which recognizes the Queen’s birthday and is celebrated every April 30. 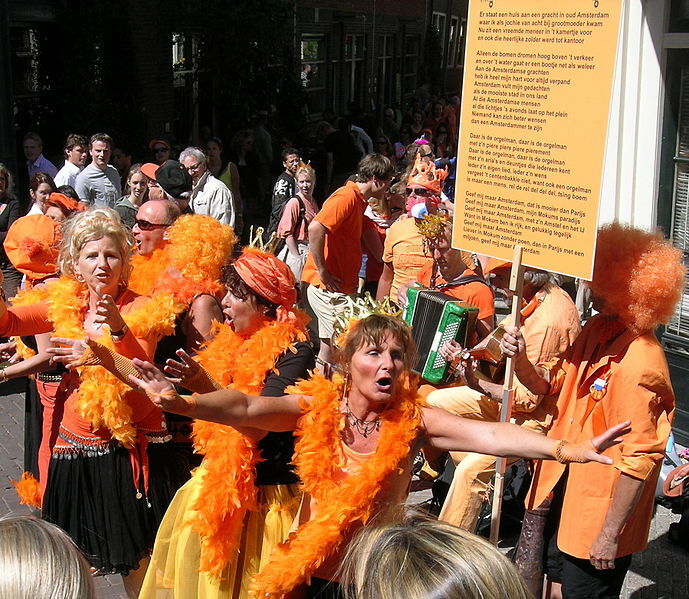 As an American, I could barely say it let alone did I know exactly what Koninginnedag would be like. But, like her loyal subjects, I figured I could drink tea with my pinky up in the air, eat crustless cucumber sandwiches and wave to Queen Beatrix as she rode by in a horse-drawn carriage. Leah, Amy and I, who were on a college study abroad program based 30 minutes away in Leiden, wanted to check out the whole monarchy thing. However, as we walked out on to the Amsterdam streets, we got sucked into the detour to debauchery. People spilled out of the packed bars, slammed beers on the streets and sat on rooftops. It was clear that we needed to start drinking alcohol right away. It was 9:30 a.m.
Side streets and alleyways often exude mystery. What’s around the corner or what will I find? Danger? Intrigue? 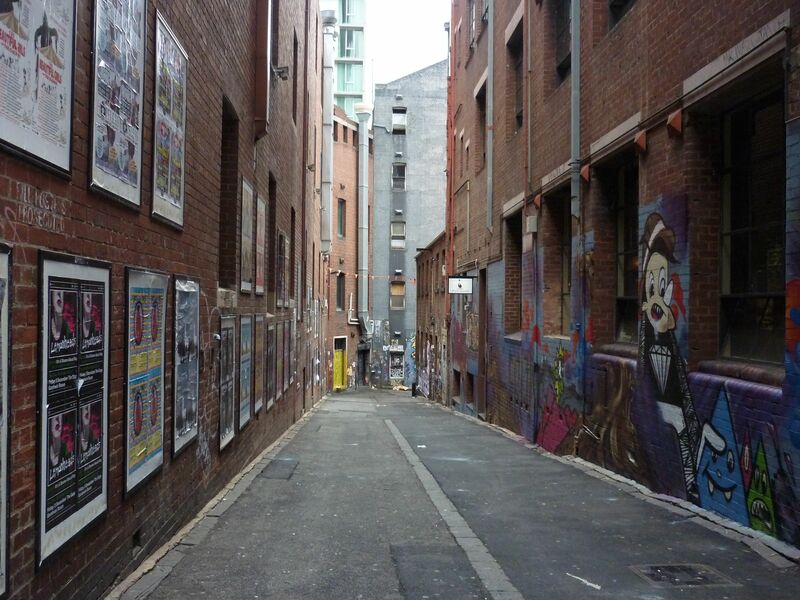 Side streets and alleys often have a negative, managing connotation and are associated with dodgy activities. Perhaps, that’s the appeal. 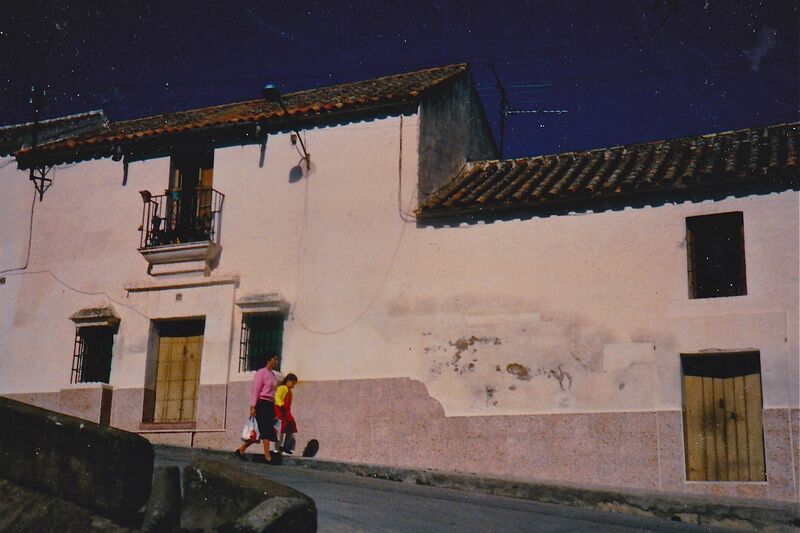 The photo collection of alleyways and side streets here is not particularly threatening — especially since the photos were taken in the daytime. 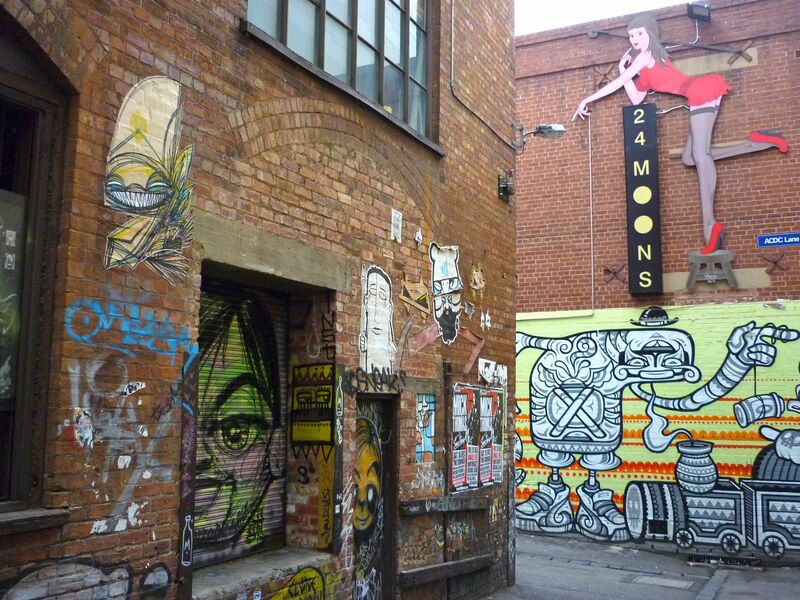 However, each alleyway and street offered something interesting. The shot above and the following two pictures I took in Melbourne, Australia. I was lucky to be traveling with Amy, a dear friend of mine who is an excellent photographer, and she inspired me to appreciate beauty in even the smallest detail. 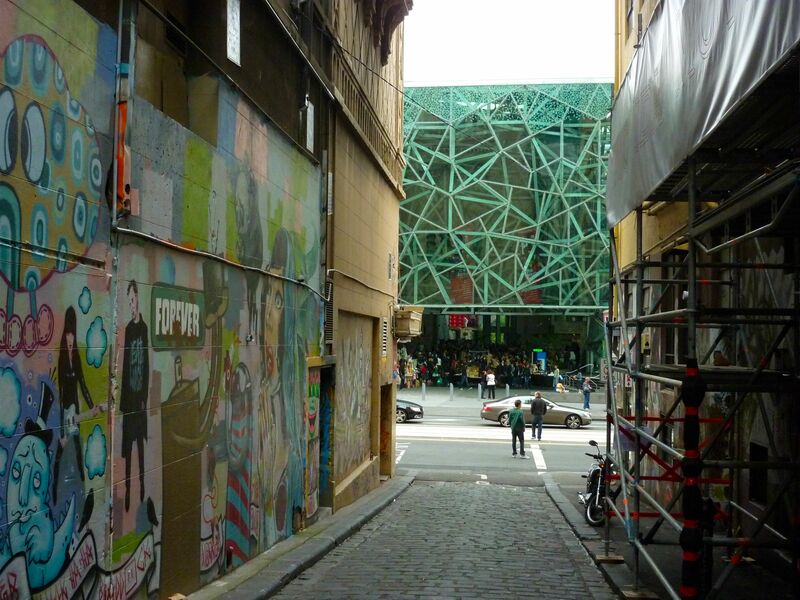 I really like this shot above because you can see Federation Square — perhaps the opposite of an alleyway — A cheery meeting place with heaps of activity. I love bridges. They are artistic, functional and symbolic. Just the idea of connecting two places along with a way to further travel is enough reason for me to appreciate bridges. It must have started for me at an early age because grew up in Eden Prairie, MN, USA. It was the town with the Graffiti Bridge, after which rocker Prince named his 1990 movie and album. The following are photos from my travels, and the majority are pictures of structures found in the United States, Europe and Australia. One of my travel goals is to take photos of bridges in Africa, South America and more from Asia. 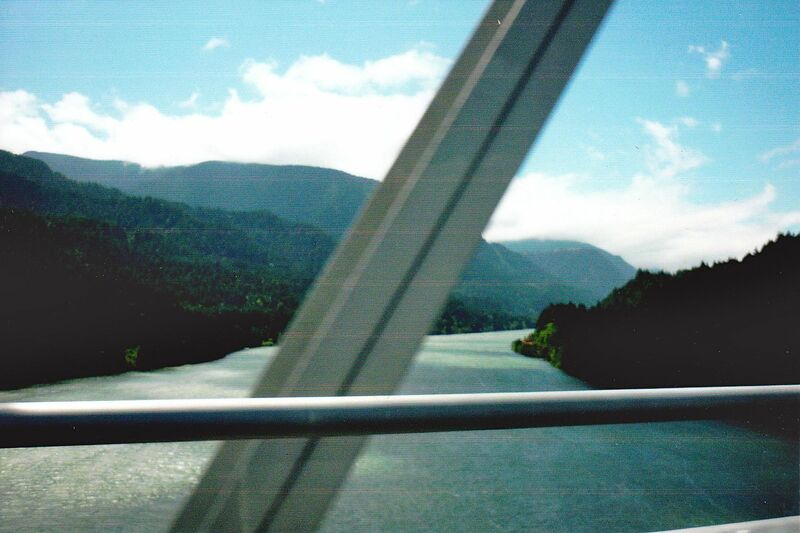 Above is the Hood River Bridge that spans over the Columbia River from Hood River Oregon and White Salmon, Washington. Prague, Czech Republic. 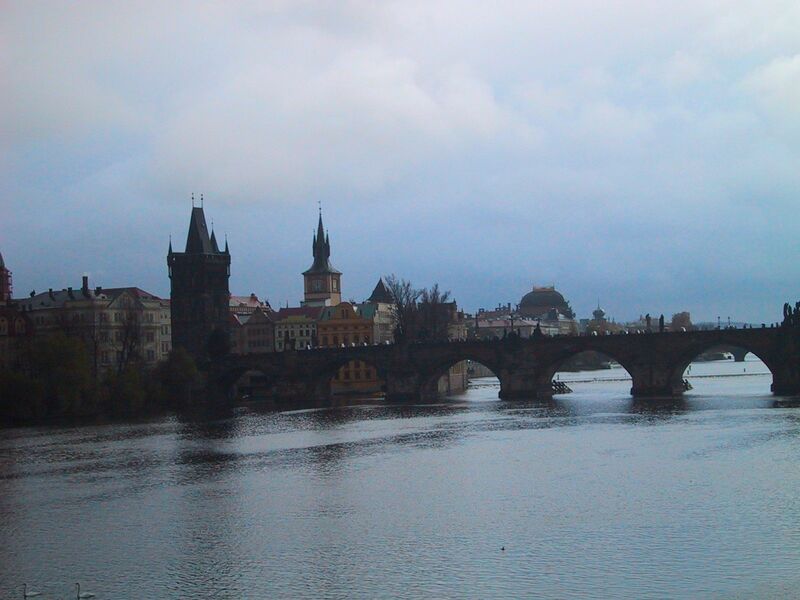 Prague has the bridges — here’s the Charles Bridge, which is sort of sandwiched in between two other bridges. It is a very recognizable landmark. Because of the recent unthinkable tragedy in the United States, I’ve been thinking quite a bit about my own kids and children in general. I want this Travel Ahh…to be a celebration of children and their innocence. The photo above is of a child in East Berlin, East Germany feeding pigeons in a mall area. I love how kids can be captivated by a bird adults think of as a dirty pest. Exouth, Western Australia. Putting your hands in mud or dirt is a universal joy. This is my daughter, Kasey, who was fascinated with the red dirt. Ubud, Bali, Indonesia. These shy girls were coming home from school and they kindly agreed to have their photo taken. 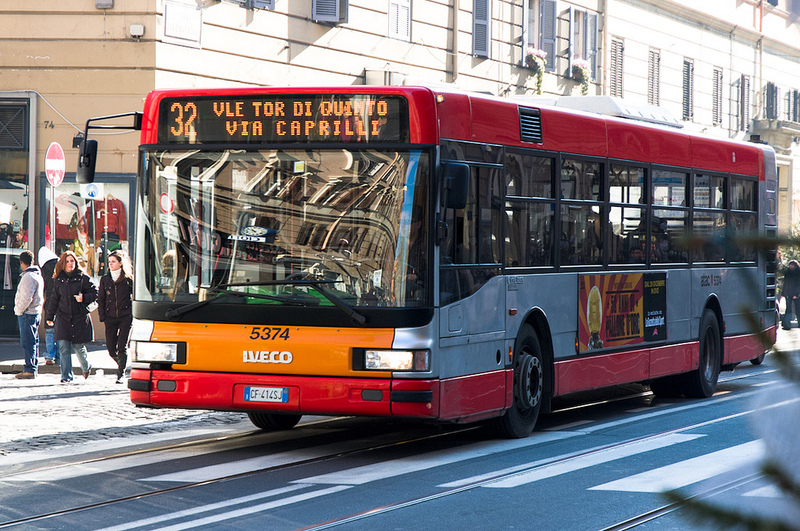 Roads and streets are definitely symbolic when it comes to travel. Just listen to Steppenwolf’s “Born to be Wild” or read Jack Kerouac’s On the Road. Of course, when you are stuck in traffic during a commute, the road is the last place where you want to be. But, when you’re traveling, roads and streets always lead somewhere new or unexpected. Sometimes it’s not always the destination, but what you see on the way that is so striking. (The photo above was taken along a remote road on Kangaroo Island, Australia. 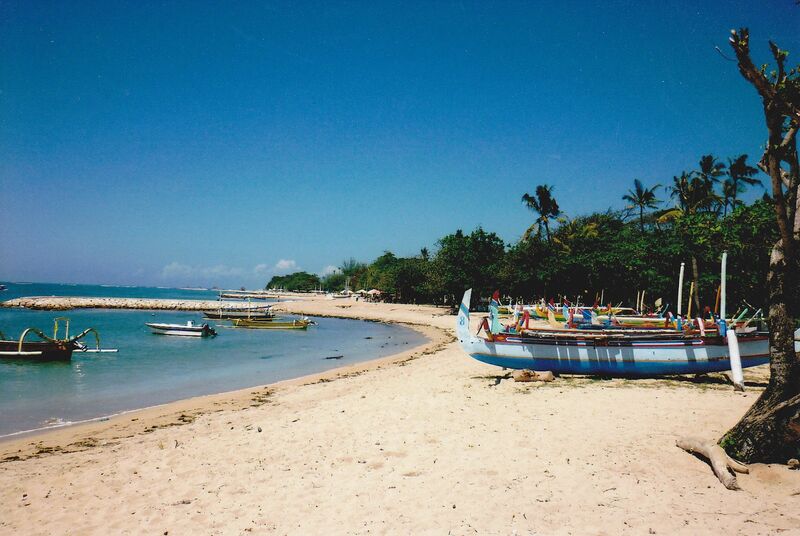 There’s something about a boat (like the one above in Sanur, Bali.) Partly, I think it’s about water, imagining the waves sloshing and spraying against the sides, but, to me, it’s comforting to see boats — fishing boats especially. When traveling, I always try to get shots with boats displaying flags. Again, scenes like this are part of a culture’s daily life that, really, would it be all that exciting if I saw this at home? Actually, I am just that snap happy, because, not even thinking about it, I took photos this summer of boats in my home state of Minnesota. Gimme Shelter — How about a Castle in Visegrád, Hungary? Visegrád, Hungary, 2006. For a wedding setting, it’s hard to beat a medieval castle and citadel built in the 13th century on a high hill above the Danube River. My friend Rob and his Hungarian fiance, Kate, got married here. Most of the wedding took place at the citadel. The crumbling walls added an ancient feeling to the ceremony. 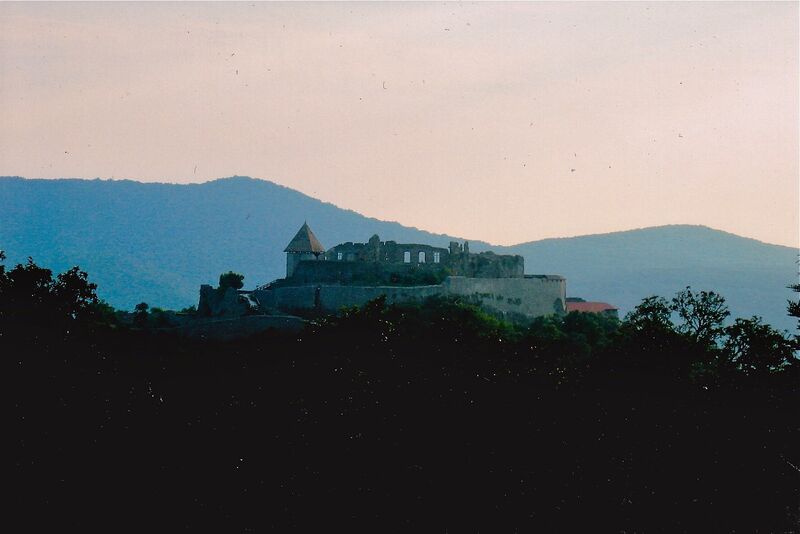 At one point, Visegrád was the royal seat of Hungary, and the castle was King Matthias Corvinus’s summer abode in the earlier 1300’s. 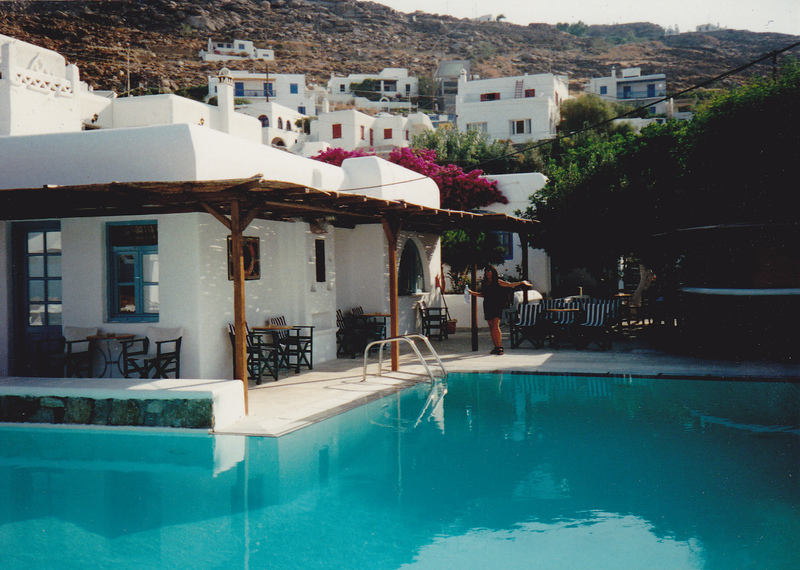 Upon arrival, it’s easy to believe you have money in Mykonos in 1995 — especially when you’ve just found a gorgeous whitewashed pension with cobalt blue trim for $13 a night. It’s got a view of the Aegean Sea, a pool and a toilet. Goats even roam the hills in the background for a quaint, rustic feel. Where is Robin Leach? “I’m ready to be interviewed about my champagne and caviar lifestyle!” In reality, for my friend Indira and me, it was more of an airline size bottle of Ouzo and a street side gyro lifestyle. On the move. Many of my travel photos share a theme of walking. It’s such an ordinary action. However, I love scenes of people walking in towns, villages and cities. It shows people in motion and conveys a feeling of a vibrant place. Walking photos also can show a casual, laid back environment.